"Went to the Hornets arena for 1st time and tried convincing security im a player. She said, 'what team?!?'" 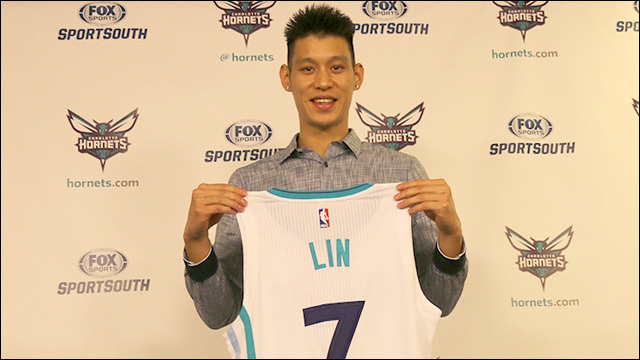 After bouncing around to several NBA teams over the last three years, I imagine that newly signed Hornets guard Jeremy Lin is arriving in Charlotte with a few things to prove. But first, he'll have to prove that he belongs on the team. No, really -- he'll have to prove that to the Hornets' security in order to get into the team arena. Over the weekend, Jeremy went to Time Warner Cable Arena, where the Hornets play, for the first time and apparently had a little bit of trouble at the door convincing arena security that he's a player. Not a fan. Not a trainer. A player. With a two-year $4.4 million contract to play for the Charlotte Hornets. It seems that we're a long way from that memorable, incredible run -- the period we affectionately refer to as "Linsanity" -- when Jeremy bust out from Knicks bench to superstardom during the second half of the 2012 season and became one of the most recognizable faces in New York City. If anything, Jeremy has just come full circle. When he first joined the Knicks, he had similar troubles getting through the players' entrance at Madison Square Garden. Security there mistook him for a trainer, because, of course, there was no way this Asian dude could be a player. "When I got to Madison Square Garden, they stopped me at the player's entrance," Jeremy recounted in the documentary Linsanity. "They said, 'Where do you think you're going? Are you a trainer?' And then another security guard came over and said, 'Hey... I think he plays on the team!'" By now, Jeremy's used to being in this place. (Hence, the "#everywhereigo hashtag.) It certainly hasn't stopped him. Here's hoping he finds his footing and carves out a role for himself with the Hornets.